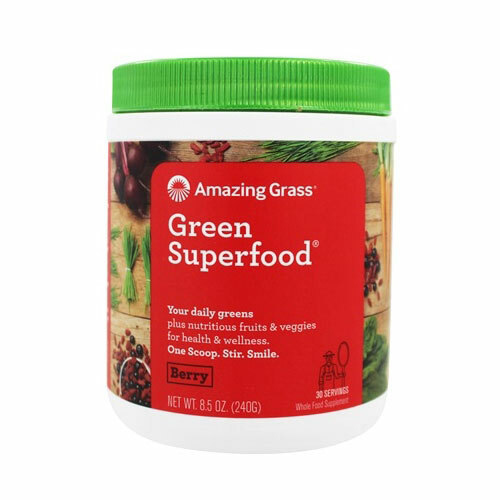 This thoughtfully crafted blend combines farm fresh greens and wholesome fruits and veggies plus nutrient-rich superfoods with a refreshing berry flavour for a delicious way to feel amazing every day. GREEN FOOD BLEND (69%) (Organic Wheat Grass, Organic Barley Grass, Organic Alfalfa, Organic Spinach, Organic Spirulina, Organic Chlorella (cracked cell-wall), Organic Broccoli). FIBRE BLEND (Fructooligosaccharides, Organic Flax Seed, Apple Pectin). FRUIT & VEGETABLE BLEND (12%) (Organic Rose Hips, Organic Pineapple, Organic Carrot, Acerola Cherry Extract (Malpighia glabra L., fruit), Green Tea Extract (Caemillia sinensis, leaf), Organic Acai, Organic Beet, Raspberry, Organic Goji, Organic Maca), Natural Flavour, Peppermint Leaf, Anti-Caking Agent (Silicon Dioxide). ENZYME BLEND (Lactobacillus acidophilus, Protease, Amylase, Lipase, Lactase, Cellulase). Below are reviews of Amazing Grass Green Superfood Berry - 240g by bodykind customers. If you have tried this product we'd love to hear what you think so please leave a review. This is so full of berry flavour! I really liked this product. If I am having a heavy day at work I will have another drink of this in the late afternoon and I can feel it giving me an energy boost. I like the Original one too. I love this superfood.It is very tasty to do smoothies on its basic.I recommend it in the summer with apple juice.And after training,it's very good.I'll order more..
Love this product . Wasn’t really a believer of products like this. But have been using it for 1 month and have noticed such a difference .